Spider-Man learns that “Nothing Can Stop the Juggernaut”. What is it about “Nothing Can Stop the Juggernaut” that has made it one of the most enduring Spider-Man stories for longtime fans of the Web-Slinger? It could be that it’s a perfect exhibition of everything readers want in their comic book heroes. Our Friendly Neighborhood crime fighter puts forth every ounce of himself to take down a bad guy who overpowers him in spades. Though fans may have responded to this fairly obscure X-Men villain who possesses exactly what readers look for in a heavy: he’s beyond formidable, he’s exceptionally nasty, and there’s no clear way he can be defeated. None. So is it the hero or the villain that folks responded to in this classic story? It’s both. Let’s start with Juggernaut, a criminal who had only tussled with a handful of Marvel heroes by the point “The Amazing Spider-Man” #229 was published in 1982. He had been around for about 17 years by then, but the Juggernaut had thus far failed to appeal with mainstream readers. The aptly named nasty is an unyielding force, pretty much impermeable to any attack and he’s built like a tank. Writer Roger Stern and artist John Romita, Jr. give the character a proper stage to showcase the immensity of Juggernaut’s strength and his treachery, something that is equal to his immeasurable power. Juggernaut has been tasked with acquiring the clairvoyant Madame Web and bringing her back to his associate, Black Tom Cassidy. Stern and Romita have Juggernaut walk straight towards Madame Web, from New York Harbor to Midtown New York. Straight towards her. Through buildings, through traffic, and through police barricades, nothing stands in the way of Juggernaut, who cares little for the destructive nature of his constitutional. Considering this is the home of the Fantastic Four, the Avengers, and dozens of other masked heroes demonstrates the brazenness of Juggernaut’s traipsing. At any moment Ben Grimm could come out of nowhere to give the cretin an ever-lovin’ wallop, but he shows zero concern for the likelihood that a superheroic confrontation may be in the cards. When Spider-Man arrives just behind the crumbled path of Juggernaut, we’re ready for these two to enter into battle. But there is none to be had. Spider-Man does anything he is physically capable of doing to stop Juggernaut. Remember the title of the story? Yeah, Spider-Man is about to learn just how unstoppable this guy really is. 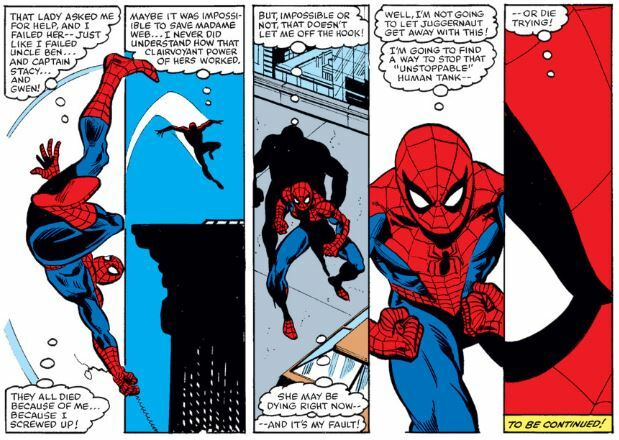 At one point, as the hero attempts to subdue the villain, Juggernaut grabs Spidey’s arm tightly and walks straight through the side of a building, leaving the struggling hero with no option but to brace himself for the painful experience. Juggernaut comes out the other side of the building Spider-Man-less. Other than getting his clock cleaned throughout “The Amazing Spider-Man” #229, Spider-Man has little to do in the story’s first chapter. This issue is designed to illustrate that Juggernaut is pretty much indestructible and one of the meanest dudes the Web-Head has ever faced. Once he finally reaches his prey, Juggernaut wrenches Madame Web from her throne and she immediately goes into convulsions. Juggernaut then tosses Madame Web, a frail elderly woman with a striking resemblance to Aunt May, straight to the ground like she was ragdoll. We understood that Juggernaut was a substantial brute, but the extent of his brutality wasn’t clear until this climactic scene. Now the readers, and Spider-Man, fully understand that Juggernaut is a wretched monster. Spider-Man is not about to let Juggernaut get away. The issue ends with Spider-Man proclaiming that he is going to make things right by Madame Web and bring the Juggernaut to justice, which takes us straight into issue #230 of “The Amazing Spider-Man”. For twenty-three pages Stern and Romita did their best to make us believe that nothing can stop the Juggernaut. And even though Spider-Man has learned this lesson firsthand, he is prepared to find a way. Spider-Man starts by tossing some heavy-duty objects at Juggernaut to grab his attention. First a steel girder, then a wrecking ball, but neither are enough to stop the unstoppable thug. Or are they? 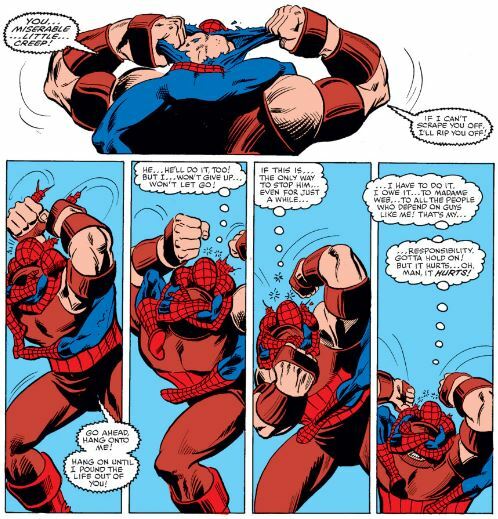 In fact, for the first time in this two-part story, Spider-Man manages to stop the Juggernaut momentarily as the he chooses to spar with the Wall-Crawler. Spider-Man uses the opportunity to take Juggernaut down. If there’s anything that has come easy to Spider-Man over the years, it’s his ability to annoy his opponents. 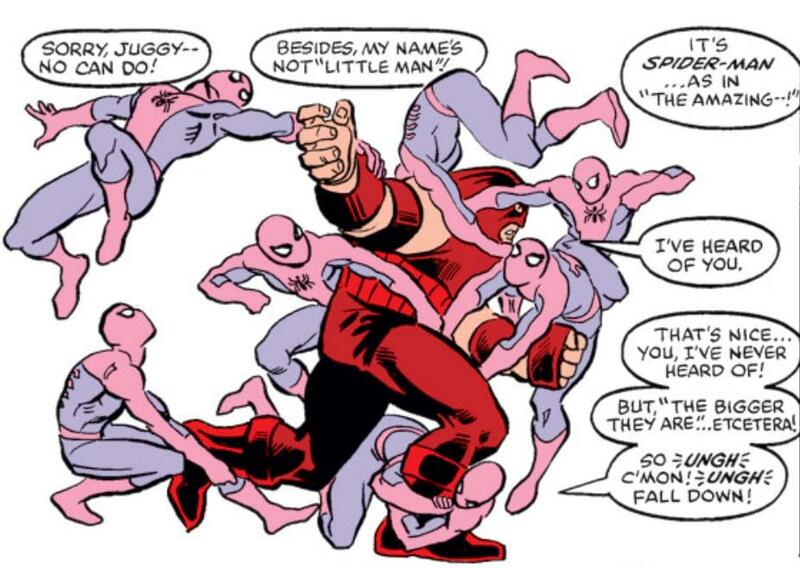 By getting under Juggernaut’s skin, Spidey is able to keep him at bay long enough to work out how to defeat him. Spider-Man knows he is incapable of beating Juggernaut into submission, but he displays the same determination that Juggernaut did in the first chapter. This time it’s Spider-Man who will not stop until his job is done. Finally, when Spider-Man has nothing left to throw at his adversary, the hero jumps on top of Juggernaut and covers his eyes. By sheer luck, Juggernaut walks right into freshly poured cement while giving Spider-Man a severe beating. The only misstep in the issue is that Spider-Man stops the Juggernaut by chance, rather than intentionally submerging him in this temporary tomb. A minor quibble though, as it takes nothing away from Spider-Man’s resolve to bring the criminal to justice. Spider-Man is prepared to fight Juggernaut until the bitter end if need be. Ultimately it is Spider-Man’s willpower that is unstoppable. The story was simple enough to have been told through a typical one-shot—a crook walks to and from the scene of a crime—but by highlighting Juggernaut’s physical prowess and malice for the entirety of the story’s first chapter, it makes Spidey’s victory all the more satisfying by the time we reach the conclusion. And it makes for a hell of a memorable story. The story was originally published in the summer of 1982, a few days before my eleventh birthday. My twin brother and I would take turns reading and rereading the exciting story as we found ourselves completely enamored with Juggernaut, a character with whom neither of us were familiar. After reading the story dozens of times over the next few months, just imagine what must have been going through our adolescent minds when Juggernaut was the featured villain on “Spider-Man and His Amazing Friends” later that year. In the episode titled “A Firestar is Born” (true, if not so fun, fact), Juggernaut faces off against Spider-Man, his Amazing Friends, and the X-Men (the X-Men!). About ten years ago, I drove around to what seemed like every comic shop in Orange County and Los Angeles to find the original issues of “The Amazing Spider-Man” #229 and #230. I wanted to give them to my brother as a gift for Christmas and I had long sold the original issues along with hundreds of other classic titles from the era (in case you’re wondering, one never forgives oneself for such a transgression). With a single shake, my brother can usually accurately guess the contents of a wrapped gift. Usually. I can still see the surprise cross his face as he gazed down at two of his all-time favorite books taped snugly within a box lid. We both reverted to our eleven-year-old selves as we discussed the impact the story had on us in the earliest days of our comic book reading. Thirty-plus years later, this David and Goliath-style tale continues to resonate with comic fans who probably didn’t expect anything special when they originally picked up “The Amazing Spider-Man” #229. What they got was an unforgettable appearance by a spectacularly cool super-villain, a defining adventure for one of comicdom’s greatest heroes, and a story that would be fondly remembered in the decades to follow.